Lots going on at the moment, so I thought I would give you all a very brief overview of recent developments. It’s hard to believe that it’s now less than two months until A GOOD AMERICAN is published. And there was me thinking this time would drag. It has rushed by. The goodreads galley giveaway that I talked about a while back ended, with an immensely gratifying 1,047 people taking the trouble to enter. Congratulations to the lucky 25 winners! There is presently another giveaway in progress – this time for signed galleys. This one involves people writing to me directly to tell me about where their families came from. I have loved reading the many, many responses I’ve received – people have been so generous with their stories, with interesting tales of journeys to America (and elsewhere) from all corners of the globe, some even with photos for good measure. One of the characters in the novel says, “We all came here from somewhere,” and here’s the proof. We’re continuing to hear news about review coverage. The novel was favorably reviewed last week in two of the book industry’s major trade publications, Publisher’s Weekly and Library Journal. Last Wednesday A GOOD AMERICAN was featured on the blog of the BookPage website. It was a wonderful, generous review. I have an interview scheduled with BookPage on Friday for an author feature that will appear around the time of publication. We also heard this week that the novel will be reviewed in American Way, the in-flight magazine of American Airways. This is exciting news – an awful lot of people get on those planes during the course of a month, and they are the living definition of a “captive audience”. We are busy firming up dates for bookshop events in February and I will report back on those shortly. I can tell however tell you that on publication day itself – February 7, 2012 (but you knew that, right?) I’ll be doing an event at 7 p.m. at the Barnes & Noble in Columbia, Missouri. Later that week I shall be taking off for far-flung places to visit a couple of independent bookstores of high repute, and I cannot wait. Meet Theo. (Short for Thelonious. Spot the jazz nerd.) 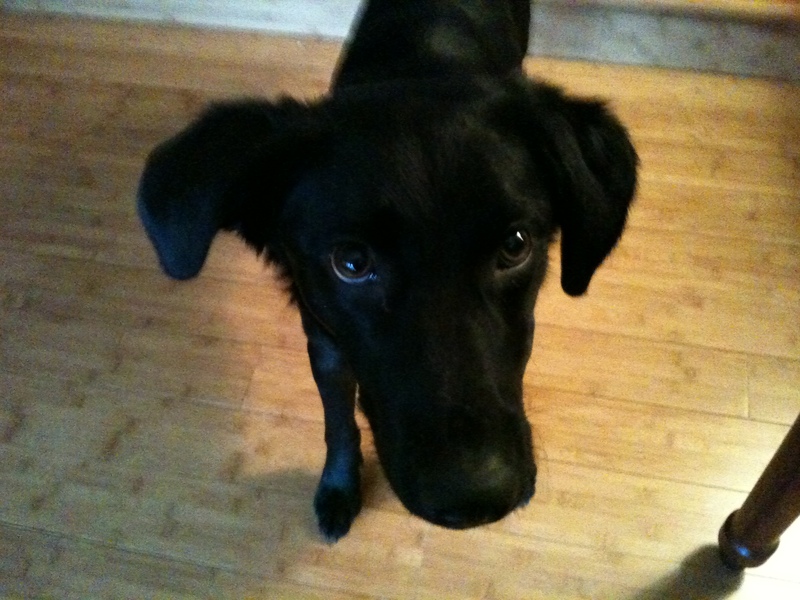 He is a ten month old labrador/retriever mix. He is utterly adorable – look at those eyes! – and we are all madly in love with him. I will admit that it is sometimes a little difficult to focus on the next felicitous turn of phrase when he walks over and plonks his beautiful head in my lap and looks up at me. I’m reminded of my favorite book dedication, by P.G. Wodehouse, who dedicated a book to his step-daughter, “without whose tender affections this book would have been finished in half the time.” Yep. That. Great news, and what a sweet dog! I love that face.